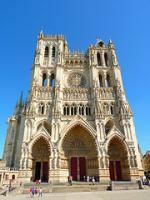 Amiens Cathedral has played an important role in the development of gothic architecture. It dates from the 13th century. Work was started in 1220, under Bishop Evrard de Fouilloy. The architects involved were Robert de Luzarches (until 1228), Thomas de Cormont (until 1258), and his son Renaud de Cormont (until 1288). Amiens was an important town in the Middle Ages, but nowadays is rather inconspicuous. It has a lot of modern buildings (and a second WHS, the Belfry). The 13th century Cathedral is located in a built up area, among shopping streets. It's in good condition. The facade is its most striking point: with many fine sculptural details, especially above the doors. The inside of the church is like a religious art museum. 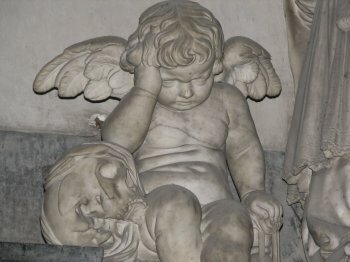 There's for example a fascinating sculpture of a weeping angel (which became a popular postcard for soldiers in WWI). Also remarkable is the alleged head of John the Baptist. This relic was brought from Constantinople by Wallon de Sarton as he was returning from the Fourth Crusade. After visiting this site, I wondered how many Gothic cathedrals the List can handle. And which one is the oldest / purest / biggest / most beautiful? In his Comparative Study Of Gothic Churches, carried out for ICOMOS in 1988, the distinguished Swiss expert Professor Peter Kurmann identified no less than 15 churches elegible for a priority list (and that doesn't include the ones inscribed pre-1988, like Amiens and Chartres). So there's still more of those to come. From his report, we also learn that the cathedrals of Seville, Milan and Cologne are the largest Gothic cathedrals in the world. I would say that Amiens' unique selling point lies in its sculptures. I went to Amiens with 3 friends in April 2016, driving from Calais after having passed through the "Chunnel". The area close to the Eurotunnel’s southern end is rich in World Heritage Sites. Options included the city of Bruges, the 56 Belfries of of Belgium and France or even the 108 component parts of the Nord-Pas de Calais Mining Basin. Seeing mounds of slag or individual bell-towers wasn’t quite enough to excite us, though, so the city of Amiens was chosen as our primary port of call. We spent both our nights there in the city’s historic centre, drinking by the attractive Somme riverside. The cathedral is imposing, impressive, clean and free to enter. We enjoyed the "stone encyclopaedia" on its main façade and the 42 metre high nave. Amiens was one of five Gothic cathedrals on the WH list, which we visited on our trip through northern France in summer 2015, so it can be said that I have physically experienced the over-representation of this category. Having said that, I must admit that the Amiens Cathedral was my favourite Gothic cathedral. 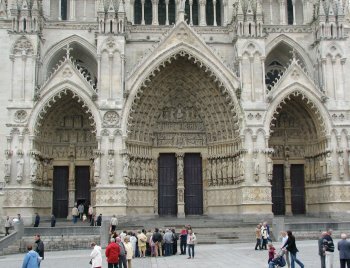 The exterior is very similar to the cathedral in Reims: the impressive size, the elaborate sculptures on the west portal, the striking rose window. The construction of both cathedrals started around the same time in the early 13th century. But the real surprise was the interior, in particular how bright it is, an excellent example for light-flooded Gothic architecture. Amiens has the highest nave of all WHS cathedrals, but it is also a filigree and elegant construction. And there are a lot of notable artworks: the wood carvings of the choir stalls, many polychrome sculptures, and the marble pulpit. The floor is tiled in striking black-and-white geometric patterns. In the centre of the pattern is the labyrinth. 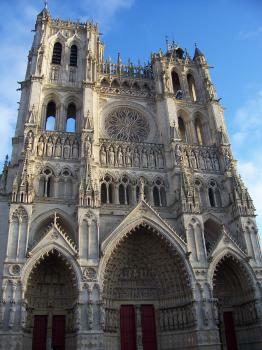 Unlike in Chartres, it is not the original from the Middle Ages because it was destroyed during the French Revolution. The new labyrinth was built true to the original at the beginning of the 19th century. 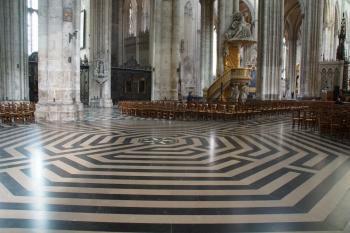 But the big plus in Amiens: the labyrinth is not covered with chairs, it is visible! We also visited the light show at night that recreates the original colours of the façade. It was much better than expected. The colours were projected onto the sculptures with high precision, so that we could study the effect even at close distance. Hard to believe that the façade was once so colourful. Five cathedrals in three weeks was a bit too much of Gothic symbolism: these high naves and ribbed vaults, the slender columns that seem to rise directly up into the sky, the elaborately crafted portals, all these stained glass windows and the play of light and colour. Undoubtedly, they are all masterpieces of art and architecture. However, I never became really enthusiastic about Gothic style. So in the end our trip to northern France confirmed my preference for Romanesque architecture. My wife and I took a train to Amiens from Paris in July to watch the end of Stage 5 of the Tour de Paris. We arrived early enough to walk around the town center and spend om time in the cathedral. As a history teacher I knew of the history of the cathedral (its height, the cracks, the chain, etc) but it was thrilling to see them. While it is sad that the cathedral has lost most of its stained glass to the World Wars the fact that most of the glass is now clear makes the cathedral much more illuminated than others and really accents the height of the structure. Like others I found the statues to be amazing the and the WWI memorials to be quite touching. Unfortunately,didn't get to linger long after the race as several open air restaurants looked quite good and the prices were much lower than Paris. Al Mettel was a popular American artist who made his living and financed his travels from his art. Among his specialties were churches, including many of the most significant of France. One of those he painted as the Cathedral of Amiens in a view from a river bridge. As far back as I can remember that picture hung in my room, usually over my bed. I still have it some 60 years later. It's one of my most cherished possessions, although it's of no great monetary value. Art became life in 1989 when I was traveling in Europe in the early winter. It was cold and foggy on the train from Bruxelles to Paris and we stopped briefly in Amiens. I looked out the window and immediately recognized the Cathedral from the picture in my room. I hurriedly got off the train and slowly made my way through the damp fog to the church which looked almost surreal in the golden light from the street lamps along my way. By the time I got to the Cathedral it was closed and deserted. I walked around it twice, took a few pictures, and made my way back to the train station to wait for the next train to Paris. My brother and I visited Amiens in Sept. 2011 as a 2 day stopover as part of our WW1 Battlefields tour. We were fortunate enough to be shown around this magnificent Cathedrale. We were also lucky enough to be shown around the internal balcony and out on the roof. The floor takes on a different perspective about 20 metres up. I have no religious interest at all but found this cathedral fascinating, the architecture and the sheer size were most impressive. From the right angle you can see the bend in the timber spire, and the laser light show is worth a look too. I visited this WHS in Summer 2011. The flying buttresses of the Cathedral of Our Lady of Amiens were immediately visible from far away as I approached Amiens by car. The West front of the cathedral with the rose window is amazing and has several gothic sculptures. It is also the tallest complete cathedral in France. Worth visiting together with the Amiens belfry (also a WHS). I'm sorry to inform our Austrian friend above that there are not at least 20 other cathedrals in France very similar to Amiens . 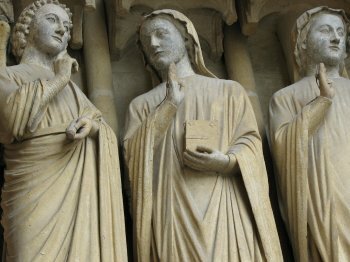 In fact only Chartres and Reims compare in terms of the quantity and quality of statuary on the facade . Only Reims and Bourges compare in terms of vastness of interior space. There are 7 ' plus grande Cathedrales de France ' as the french call them - " Reims, Chartres, Amiens , Bourges , Albi , Strasbourg , Rouen " . There are many fine ones other than those , but they're mostly about half the size and have suffered over the ceunturies more . 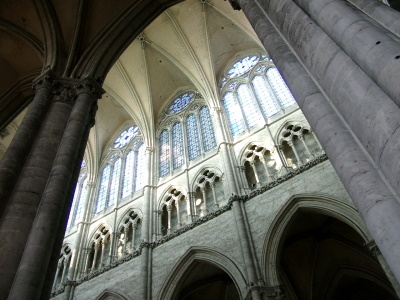 The flamboyant window tracery in Amiens is shared only by two other Cathedrals , those of Beauvais and Evreux . The remarkable symbolic quatrefoil carvings on the stylobate ( the bit above the steps and below the porches ! ) are only repeated at one other cathedral - Auxerre -( OK , and a little bit at Metz too - but that's it ! ) . Amiens is France's and Europe's most elegant Cathedral . The fact that it has lost 80 per cent of it's stained glass does not detract from this . Not as immediatley dramatic inside as Reims or Angers - it (to me anyway ) is France's finest building - period ! The interio I agree it's stunning. But it's me or the western facade it's a little bit...huh...confused and lacking of a general plan? Looks a little bit "chaotical" if you know what I mean...well the statues are impressive i know, but...it's more like a wonderful "museum deposit" than a western facade.. don't know...notre dame in paris have another kind of design purity...but then again, who cares if the facade isn't the top, when you got a shining interior like the one you have in Amiens? We were there 3 weeks ago. Had 3 nights in Amiens, but had never heard of the cathedral prior to going to the town. We were in the area to tour WW1 Western Front battlefield sites. We saw the sound and light show,( it's too long) but what a shame that the commentary is in French. We don't speak the language, so didn't have a clue what they were saying. How about an English translation. Nice town , but dour people. Nice eateries though. Shame that so many people smoke, but that's France, I guess. I was very impressed with this cathedral. It had been a few years since I visited a huge French gothic cathedral and therefore I wasn’t suffering from the fatigue that could easily spoil a trip to this site. The cathedral is huge and surprisingly uniform, as it was built in a very swift amount of time for a Gothic cathedral. The interior is massive and contains some fine sculptures and great stained glass. Also I was happy to see the labyrinth on the floor has remained uncovered, as several other cathedrals I have visited have frustratingly places chairs over their own versions. Perhaps the most impressive thing for me was the incredible mass of sculptures on the western facade (the ‘main entrance’). It was a truly superb ensemble, the finest Gothic sculptural grouping I have seen and that was what set it apart from the many other gothic cathedrals I have visited. Amiens itself is a nice city, but not especially pretty, however it had a very friendly atmosphere and some nice shops and cafes. Of particular note was the very friendly cafe Jean Trogneux on the square overlooking the western façade of the Cathedral. I missed the light show (Son et lumière) which lights up the cathedral’s statues to reveal their original colourings. When I first heard of this I thought it was something of a tourist trap however from the images I have seen it looks magnificent and also shows the cathedral in its original Polychromatic light that would add a lot to the visiting experience. There are an awful lot of Gothic churches inscribed on the world heritage list, (at least 10 lie within 200 miles of Amiens) illustrating that this is a very over represented aspect of religious architecture. However the exceptional size and magnificent sculptures at Amiens really do justify a visit and some form of inscription on the list. A must see in Amiens, France is the niche in the Cathedral of Notre-Dame, the largest Cathedral in France, where the relic: the head of John the Baptist is displayed. The relic was brought back from Constantinople (modern Istanbul) in 1206 after the sacking of the city by the Fourth Crusade. The face is mummy like and covered by a large polished crystal to preserve it for deterioration. The authenticity has not been studied by scientist but it has been venerated since the 13th century by a steady stream of pilgrims. This relic at the very least has historical and artistic value as well as being a testament to the faith of the people who found religious significance in its presence. The People of the 21st century may be skeptics or repulsed, but the people of by-gone generations were more simple in their faith. They used such objects to enliven their faith. This alone gives this relic significance. The fact that it has endured in Amiens Cathedral for more then 9 centuries, surviving the French Revolution and two World Wars makes it worth a visit. The cathedral is breathtaking; the architecture is inspiring; and when we were there an Australia Anglican coir was singing sacred songs, which gave it an angelic sound to match the beautiful artifacts. Like some other reviewers here, I´ve seen my share of big cathedrals, and sometimes they seem to blur in memory. What´s unique about the one in Amiens ? Not that much, although it is very big and definitely beautiful. I just can´t say why it would merit WH status, since there must be at least twenty very similar cathedrals in France alone. Having said that, when you are anywhere in the area, you should go to Amiens, since the town is very nice and pleasant and it gives you the benefit of seeing three WH sites for the price of one, so to speak: besides the cathedral, the belfry, which is just a few minutes walk from the cathedral, is part of the "Belfries of Belgium and France", and - something I only noticed on a plaque inside the church - the cathedral is also part of the "Routes of Santiago de Compostela in France"! Relics from John the Baptist: The "head" was brought back as booty from Constantinople in 1206 from 4th crusade and was a partial raison d'etre for the cathedral's construction. Later "lost" but 19th century replica resides in a chapel.